General Comfort – do things fit right, is the fabric comfortable to wear? Appearance – does it look put together, is it good on my body shape? Movement – can I move comfortable, carry a stroller up stairs, sit cross-legged on the floor, etc? Outside – would I wear it outside the house, or just at home? Nursability – is it nursing-friendly? 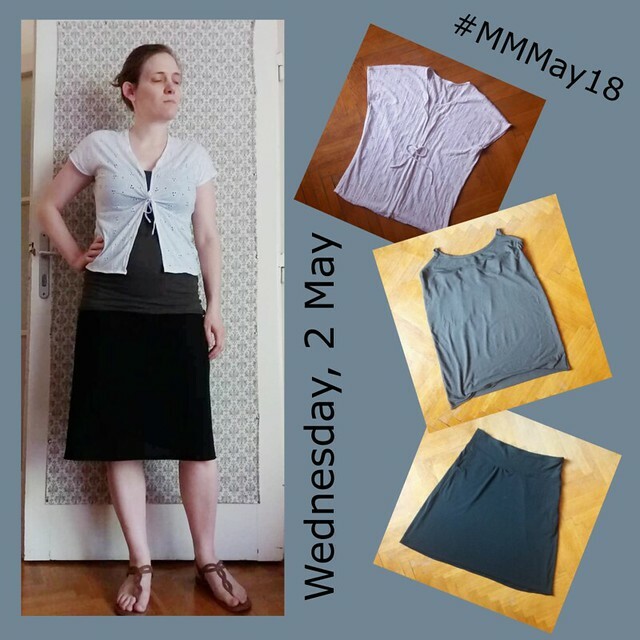 Outfit: Most of the day I was wearing my pajamas / house dress (a majorly-modified Empty Hanger Patterns Arthur Top) but for the few hours I was out I wore a white So Sew Easy Summer Drape Top (a free pattern!) and a striped knit skirt. Outfit: White summer cardigan inspired by one that Handmade by Carolyn made; nursing tank top (the one all over Pinterest, where the straps are just loops you hook onto your bra) and black knit home skirt. Outfit: White summer cardigan again because I severely underestimated the outside temps. 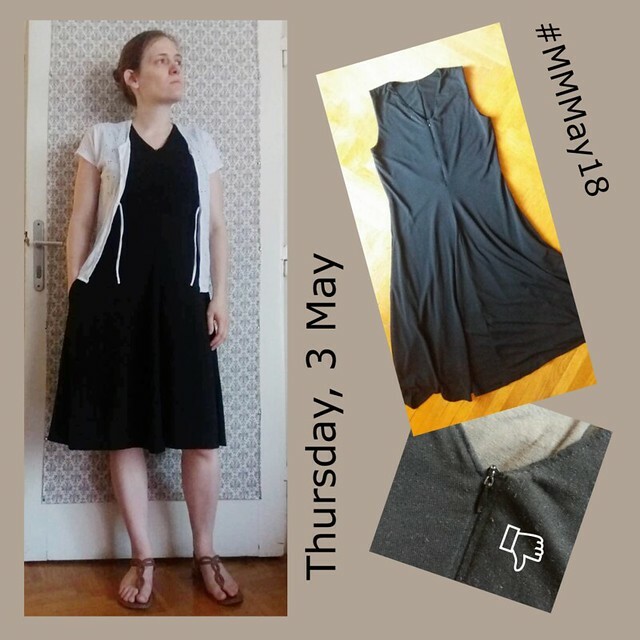 The dress is my new favorite, a sleeveless Empty Hanger Patterns Tomi Dress – it was super easy to add a center front zip to make it nursing friendly although the top of my zipper is wonky. Insights: I really like this dress, even if the zip drives me bonkers. Need more in other colors! Because black was too warm really. 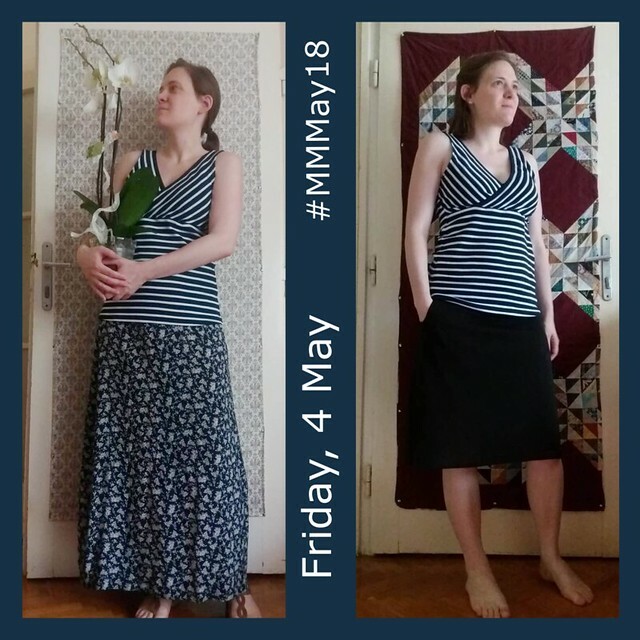 Outfit: Brand-new striped crossover tank top, first with a flowy floral maxi skirt and later with my black knit home skirt. I think in the second picture I had beauty face turned on? And while not every outfit needed to be analyzed and pointed and ranked within an inch of its life (read: I got bored of the system midway through the second week), I still came up with a pretty good idea of What I Like To Wear And Why, which in turn led to lists of what I want to rid my wardrobe of, what I want to keep, and (best part!) what I need to sew more of. (1) everything with a non-stretch waistband. Because life’s too short for tight waistbands. (2) every top that isn’t nursing-friendly. (3) most of my narrow skirts and dresses. If I’m sitting it’s usually cross-legged so pencil skirts have a limited use. The striped skirt pictured above is going to be pardoned though because I wear it often outside the house. So my plans are clear; I’ve already started working on a few things (okay, I have at least 4 projects going on in various stages) and I hope by the end of May to have finished a piece or two! 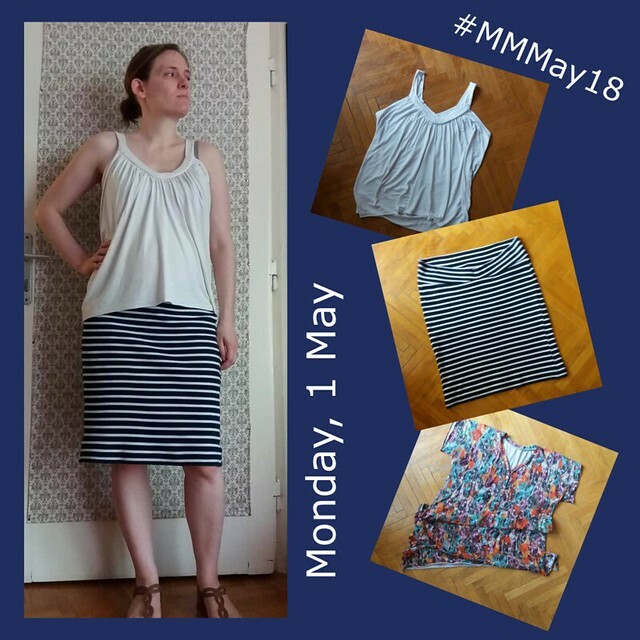 This entry was posted in sewing and tagged Me Made May, MMMay18, nursing wardrobe. Bookmark the permalink.